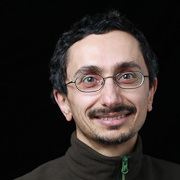 Paolo Uva is a researcher in the Bioinformatics group of CRS4. He obtained his Laurea (MSc) degree in Biology in 1999 from the University La Sapienza in Rome, Italy and then he moved in France where he received in 2002 a PhD degree in molecular phylogeny from the University of Tours, France. In 2004 he obtained a Master in Bioinformatics at the University of Geneva/Lausanne, Switzerland. As a postdoctoral scientist, he worked at the University La Sapienza in Rome, Italy (2004-2005) on the analysis of genome-wide expression data before joining in 2006 the Istituto di Ricerche di Biologia Molecolare (IRBM, owned by Merck & Co. Inc), Rome where he focused on microarray design, identification of molecular signatures in cancer and development of molecular biomarkers. In 2009 he moved to CRS4 where he concentrated on the analysis of data generated with Next Generation Sequencing technology. Current research activities are oriented towards the identification of the genetic basis of inherited disorders using exome sequencing. His research is published in international refereed journals and conferences.